Journaling a sentence each day for a month makes for a reflective blog post. I joined this challenge in 2017 and have sincerely enjoyed keeping track of my daily adventures. I had time to participate for the month of August so far this year. August 1st! Half of 2018 whizzed by! Today I cleaned and straightened up the house to prepare for family driving from Spokane, Washington. They’ll spend one night here on their way to Southern California for a memorial service. Sure was great to see them and their two grown daughters! 8/2 I went to a new Pilates class at the gym today and twisted my lower back which left me in a LOT of pain for the rest of the day! I overdid it the day before cleaning, so where is the incentive in that chore? 8/3 Morning walk with my friend. We plan to meet every Wednesday morning and walk for an hour! My back felt a lot better today, thank goodness! 8/4 Saturday, woke up at 6:30am, had coffee and took the dogs for an early walk due to the continuing heat in Northern Cal. I had good intentions to write some in my book. Nope! I ordered a new inflatable SUP from Costco instead. 8/5 Sunday at the delta. Got here just in time to get out on my regular SUP. Had I waited much longer, the wind would have blown me off the water, along with the lingering smoke from local wildfires. This is hubby’s day off so he was excited to get some windsurfing in later. 8/6 Monday morning at the delta, hoping for another SUP session, but rode my mountain bike instead. Packed up and headed home to finish sharing Sunday Stills participants’ posts and some other blogging duties. 8/7 Good workout at the gym this morning, plus walked the dogs before the heat settled in. Spent most of the day on class prep. 8/8 Day at home waiting for our water company to reset our broken meter and for a package to arrive. I managed to walk the dogs and work on more school prep. What did I get? My inflatable SUP! 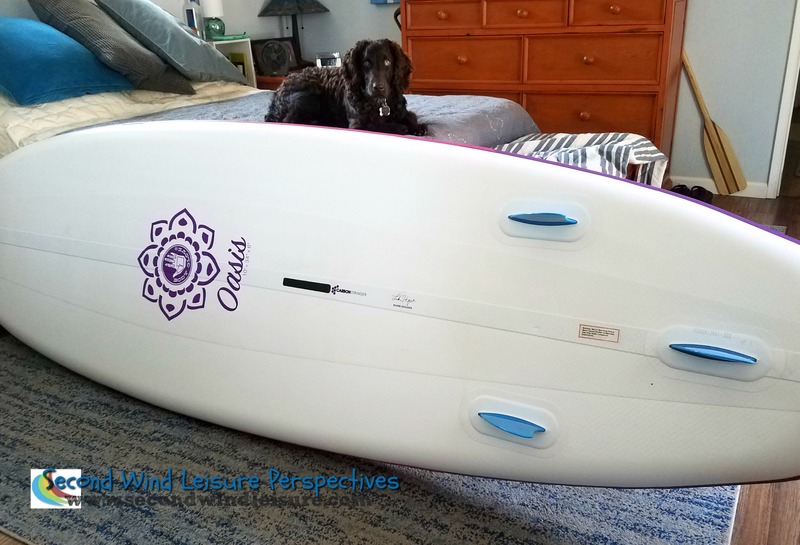 You can read more about my paddleboard escapades! 8/9 Went to a Weight Watchers meeting. Weigh-in not good…I’m a two pounds over my lifetime weight and have gained 6 pounds over all since last December. You’d think with all the physical activity I do that I could keep my weight down! Got distracted and opened my new SUP and familiarized myself with all the goodies. Once inflated, it ended up on the bedroom floor with Brodie keeping a careful eye. Brodie approves of my inflatable SUP! 8/10 Woohoo! After 7 years, I paid off my car today! 8/11-12 Back at the delta—hot day here, not much wind. Several of us got together and created a SUP/Kayak flotilla and crossed the river (a mile across) and picked scads of blackberries. There is an art to balancing a small dog and a Ziploc bag of blackberries on slightly choppy water without falling in! 8/15 Took an hour-long walk with a gal pal today. Logged over 7200 steps with just the walk. She was gracious enough to take one of my dogs for the walk. Came home worked on school stuff then went out for sushi with hubby! 8/16 Early gym workout. I’ve been listening to a great audio-book (what I listen to on the hour-long drive back and forth to the delta every weekend). I borrow these from our library system in an app called Overdrive. I can borrow e-books to read on Kindle or listen to audio-books, which are converted to MP4 format that download right to the phone. 8/18 No delta this weekend. Off to Lake Natoma to try out my new inflatable SUP. I tried it at the delta last weekend, but it does best on really flat water. So interesting to see so many others with their inflatable SUPs. 8/19 My hubby’s work schedule changed to accommodate his boss’ vacation, so he only gets Sunday off this week. I managed a morning walk with the dogs before it got hot. Hubby and I shopped for some gardening items then enjoyed a late lunch at a restaurant. 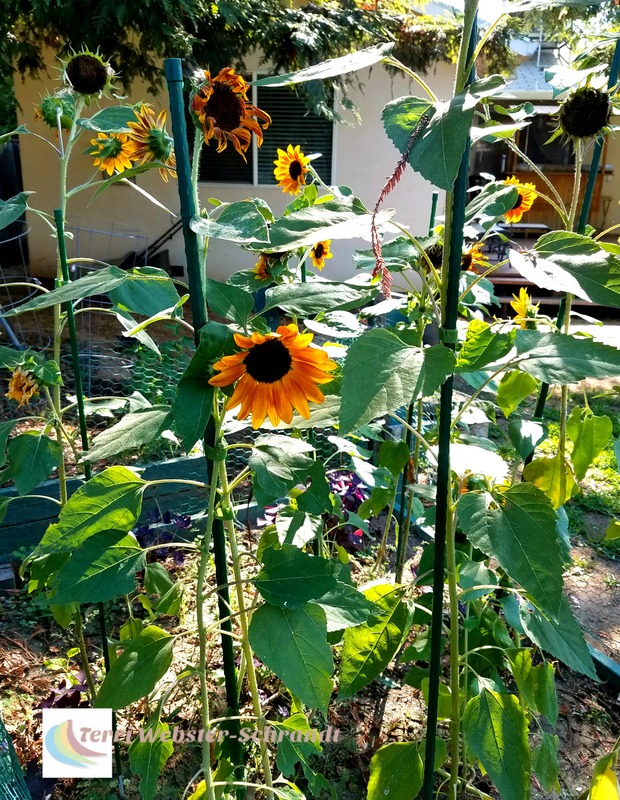 8/20 Put stakes in my sunflower garden. I think the sunflowers are happier! 8/22 ….Happy 5th Anniversary to my hubby! 8/24 Faculty workdays officially began this week. Our annual meeting was cancelled, so I spent the day enjoying one of my last long weekends in the delta. 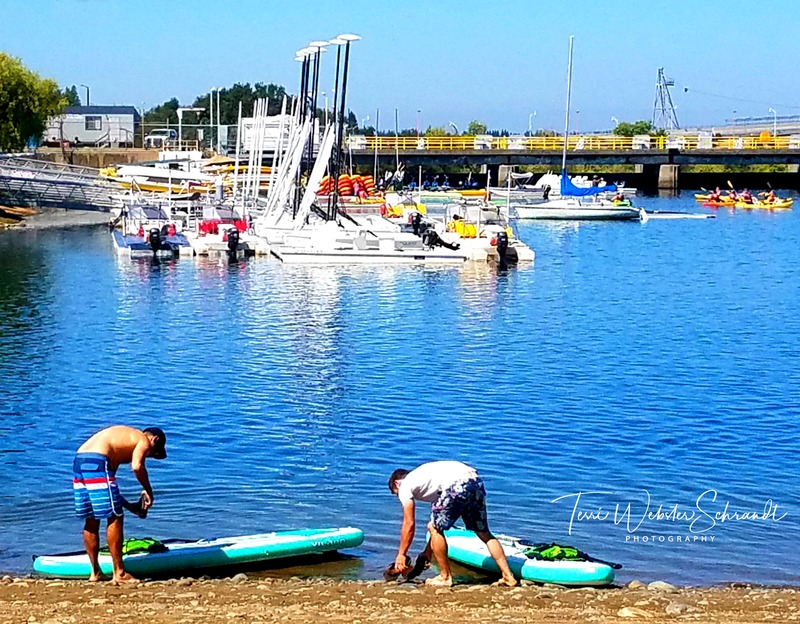 8/25 Saturday at the delta, did a SUP session with a friend, called a “downwinder.” In other words, we paddled with the river’s tide all the way to the local windsurf/paddlesports shop. Took 45 minutes but it was lovely and quite fun! 8/26 Back home today. Finishing touches and prepping for an early morning start for my first day of teaching tomorrow. 8/27 Fall classes officially start at Sacrament State University today. Got there bright and early at 7:30 to make sure I can park. First week of school traffic is always exciting. 8/28 Still energized from the first day of classes. Our secretary changed the locations of both my classrooms which helps tremendously with the space issue for the Wednesday evening class. 8/29 First night of my Wednesday night class. I have an online class that uses the same curriculum. Looking forward to technology! 8/30-31 Official start to Labor Day weekend. Celebrating a couple of friends’ birthdays, too. Interested in being part of A Sentence A Day? It is fun to jot your daily ideas down, even the seemingly mundane. Please visit Leslie at her blog Once Upon A Time & Happily Ever After. I have met some new bloggers and have enjoyed this challenge. Please visit the link-up for more Sentence a Day posts. If you are looking for a fun photography challenge, give my weekly feature Sunday Stills a try! I forgot about this concept of a sentence a day, Terri. I need to try it! You are always inspiring me. I’m impressed with your physical activity and you make it sound so fun. You have reinforced my belief, however, about activity and weight loss. They do not go hand in hand like people think. Whenever I up my activity, I eat more! Both from working up an appetite and from thinking I’ve ‘earned’ more food. The reality is that walking vigorously for 30minutes burns off the equivalent of a very small apple. Or maybe one grape. Haha! Molly, I’ve always been active and I have to up my game constantly. Women in midlife and beyond really need to to focus on strength training in addition to walking. And some days I’m just hungrier! I think you would like the Sentence a Day. Keep track each day then post it once a month–right up your alley and your humor in every day situations would be fun to read! And happy birthday…I’m still cracking up over the b-day card you posted on FAcebook! Wow, that’s alotta posting Terri! Way beyond my willingness!! LOL< luckily it's only in one blog post! Sounds like you had a great month of August, Terri. I love sunflowers. I had them for my wedding flowers. Aww, I bet they were beautiful! I wish I had thought of that 5 years ago for my second-time-around wedding, but it was a beach theme! Love this idea Terri! What a fun month too! If you create 1 sentence daily you polish your writing skills; plus you recount neat experiences. Jogging your memory improves your writing skills for it helps to have experiences to call upon, for our work. 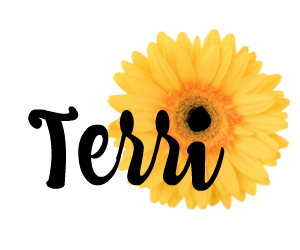 Fabulous post and blog! This was my first sentence a day post but like you I just love the daily reflection. I also enjoy reading them because you can quickly get to know a bit about a person such as you clearly are an active individual, connection made as I am too. How are you liking your SUP? I’ve had mine for a couple of years and love being on the lake and in nature sooooo much. Great read. Congrats on your first SAD post! And thank you for your kind words! I love both of my SUPs, but the new inflatable is more portable. Hope to go back out in a couple of weeks while we still have warm weather here! Nice catch-up SaD post, Terri! The sunflowers are gorgeous. Have a great Fall semester! Ouch! Ooo, Aww – you got me saying them all, Terri. Loved the sunflowers and the photo of Brodie keeping an eye on the SUP. I wonder what he must have thought? Same here with the weight gain. Even though I’ve been eating lots of salads during the summer, I’ve still put on weight! Brodie loves the paddleboard, but he might too heavy for this one. I think I mis track salads, too, Hugh, and with all the soups I make in the Fall, I tend to drop weight…here’s hoping! Forgot to also thank you for linking to my recent post where you featured as my guest, Terri. I’m looking forward to homemade soups, too. The trouble is, is that it won’t be long before our stores become full of temptations for Halloween and Christmas! I just can’t resist. Extra peddle time on the bike for me. This is exactly why I don’t keep a diary. At the end of the month it would be too depressing to see how little I’d got done. You have put me to shame! Haha, that’s funny, Graham, I’d bet you do a lot more than you think. Busy month!. So nice to be able to get to the Delta almost every weekend. Your sunflowers are beautiful, but I love the first photo with the sunflower painted on the cup. It’s quite relaxing and I’ll bet fun to drink from. I also love the black and white photos of the classroom. Stark difference from all the beautiful colors in the previous photos. Thanks so much, Sue! I’m was pleased the sunflowers actually grew in my garden! Sounds like you had a very active August! The first week of classes is always so exciting! I don’t start for a couple more weeks as we are on the quarter system, but I’m looking forward to all the promise a new quarter brings. Thanks, Andrea, although I think this August was a little quieter than the last two months. Good luck with your semester, too! Sounds like a wonderful and busy month! I’ve been wanting to try paddle boarding but fear my coordination is lacking. Thank you! I was surprised how easy it was. Youh might take to it better than you think! You don’t stop moving, Terri. This was a fun read. My favorite is the August 25 post. Thanks, Shari! It was really a nice time with a special friend! It’s so fun to catch up this way, Terri. And can I say that’s exactly why I don’t clean the house…ha ha!!! Thanks, Jodie! I’ll be heading over to your blog a little later, hopping on a plane soon! Nice catch-up! Enjoy your fall semester. 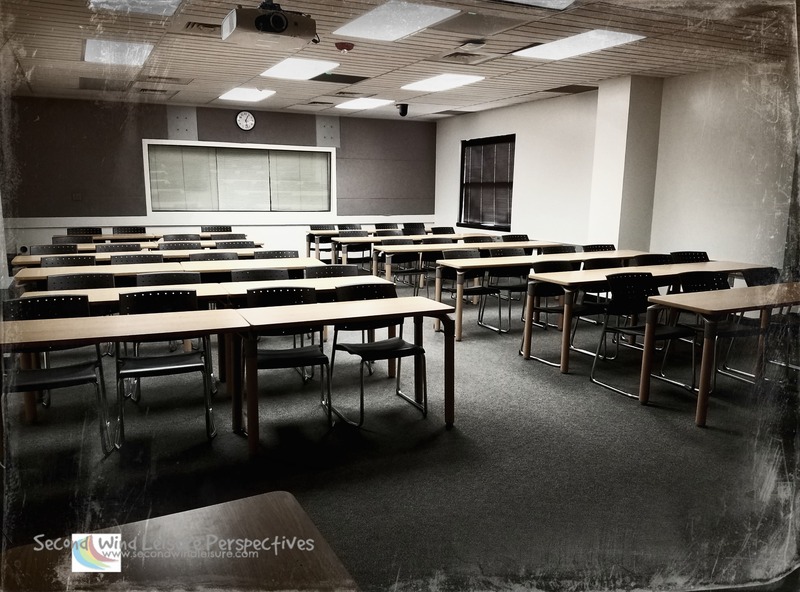 Teaching a class online must have its own challenges… or, maybe it’s a lot easier on you? Thanks, Janis! Online is not my favorite, but I’m detail-oriented so I can make it work. This class is using last semester’s videos for the class, which means I can’t deviate much from this Fall’s lectures. Two students who were in the online class transferred to the F2F class. I wish I had a big enough classroom to take them all! You had some busy month, you did! I’m still trying to metabolize my August (been to Thailand and back, so that’s a lot …) … 😉 What do you teach? I love your ‘Sentence a Day’ posts, Terri. They make me feel like we’ve just caught up in person. I agree with you — 2018 has definitely been going fast. Best of luck with the Fall Semester! Hi Donna, thank you! Fall semester started out great, with fewer students for a change. I haven’t posted for sentence a day in a while, so this felt like a catch up post too!